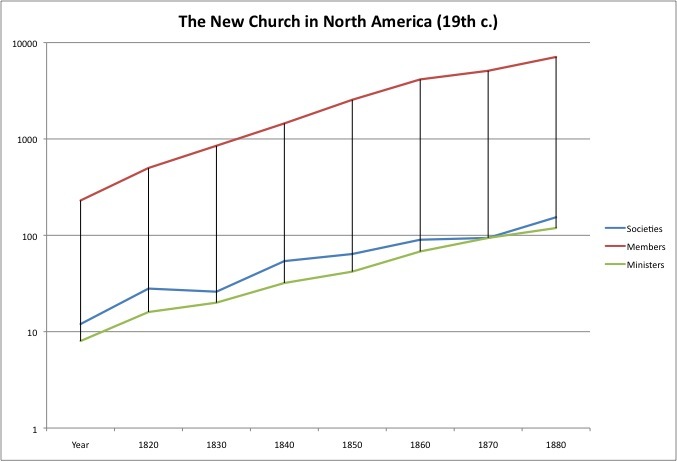 the Academy split came at the end of the nineteenth century, during which church membership had been approximately doubling every decade, ending in the highest membership the US organized New Church ever saw (7,095 in 1890) ([Marguerite Block, The New Church in the New World], p. 173). But after the split that growth not only stopped, but decline set in, to the smaller numbers that still apply to both bodies today, a century later. Unfortunately I don’t have the numbers, right now, for the 20th century, post-schism. Anyone willing to provide those? I’m looking for all North American numbers, not just General Church.